For anyone who has ever gone horseback riding, you know what an exhilarating experience it can be. Horses are one of the most beautiful and powerful animals on earth and it is an absolute privilege to be able to ride one. Horses are an extremely obedient animal and are able to help people get over the hurdles that they face every day. Many studies have been conducted on the therapeutic benefits horseback riding offers for people with disabilities, whether physical, social or developmental disabilities. 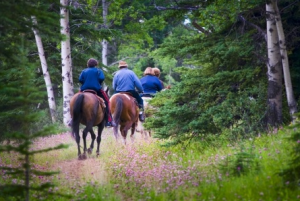 Let’s take a more in-depth look at the physical and mental rewards horseback riding can bring to anyone. Physical disabilities, injuries or even just your everyday aches and pains can get in the way of even the simplest of tasks. Modern therapeutic medicine and physical therapies are great, but horseback riding is a natural and entertaining way to strengthen core muscles, stretching the body and loosening up any tension. Horseback riding is also one of the best forms of exercise because it both challenges and calms the body. Horseback riding not only works the core, but it works the groups of muscles around the core for a very strong trunk, pelvis and back. Riding a horse is also considered to be an isometric exercise. This type of exercise works with certain muscles to help the body stay in specific positions, like keeping balance on a horse. Postural strength also can develop through horseback riding – another benefit of isometric exercise. The pelvis and thighs get the best exercise while riding a horse. Holding one’s position on horseback to prevent falling off largely relies on the strength of the pelvis and thighs. With repetition, muscle tone is increased and flexibility within the pelvis develops from horseback riding. Confidence plays a critical role in the mental health of all individuals, and learning to properly control a horse while riding aids in boosting one’s confidence. To have a successful horse riding experience, both the horse and rider need to learn to trust one another. Horses build bonds with their riders, in turn creating a sense of trust in the rider. Horseback riding also is great way to evoke a sense of calm within one’s self. Riding a horse helps to alleviate the stresses and chaos in life by drawing your focus on the horse, the way the animal moves, how he or she responds to your commands. This provides you a respite from your normal daily stresses and allows you to have time to relax and unwind while also getting great exercise. If you own a horse or are looking to purchase a horse, having a well-built and safe barn for them to live in is critical to their overall well-being. Deer Creek Structures builds beautiful horse barns of the finest craftsmanship. Feel free to browse our website gallery of barns, or give us a call at 254-546-2276 today to learn more.